Pizza dough is surprisingly easy to make in a bread machine. In fact, may bread machines have a dedicated pizza dough setting. 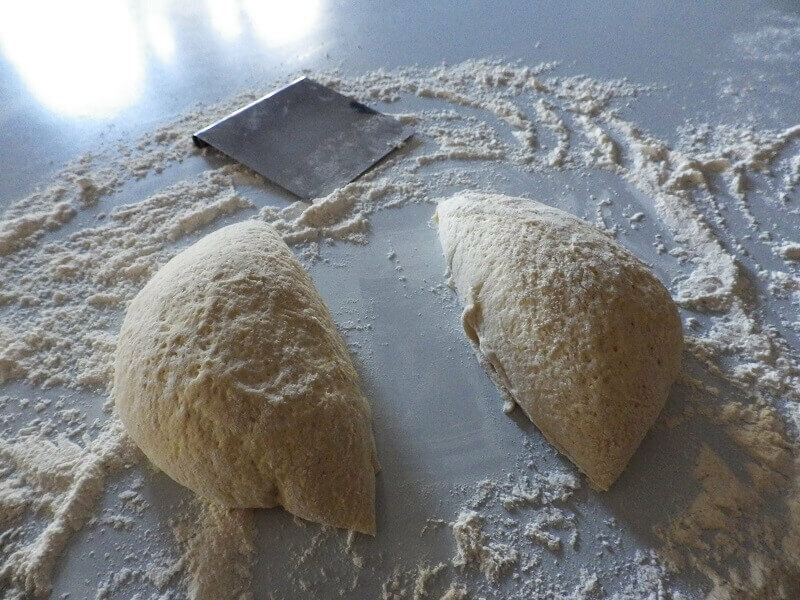 If you’re machine does not you can use the regular dough setting, but remove the dough after the kneading cycle and let it rise on a floured surface for about 30 minutes. The most fun after you’ve made the dough is topping it with your favorite toppings. It usually starts with a pizza sauce followed by as many vegetables and meats as you want. The last step is usually a generous sprinkling of shredded mozzarella cheese. 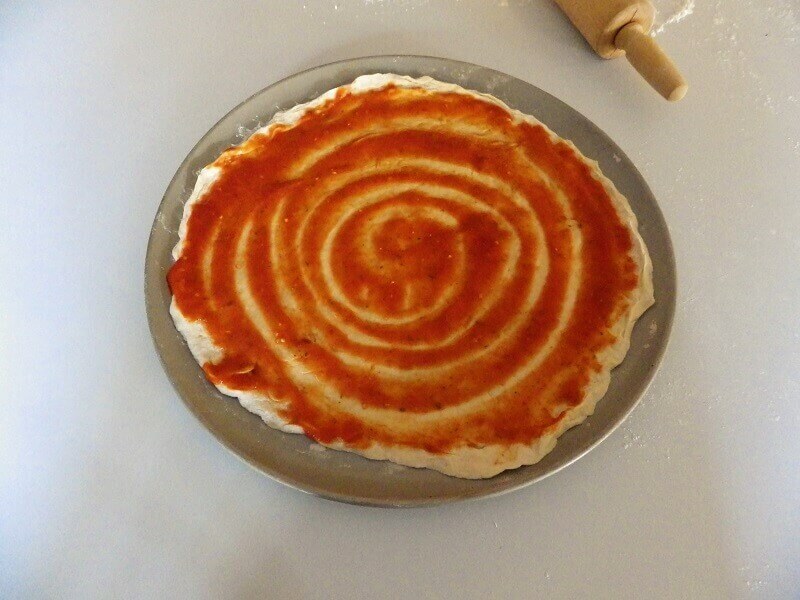 You can make any shape of size pizza that you like. In fact it’s fun to rollout mini pizzas and let everyone in the family choose their toppings. 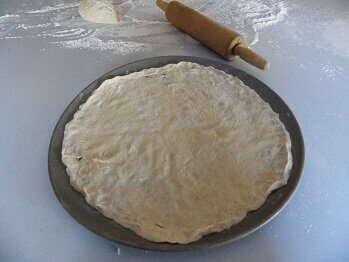 Add the ingredients to the bread pan in the order listed in the recipe and select the “Pizza Dough” cycle. If your machine does not have a “Pizza Dough” cycle you can select the standard “Dough cycle” and that should work fine. The pizza dough cycle kneads the bread a little longer to increase the elasticity but it comes out pretty close with the standard dough cycle if you remove it before the rise cycles are complete. 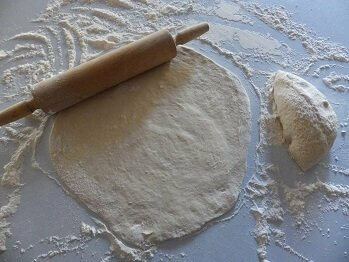 The reason is to retain the elasticity of the dough. Once the dough is finished, dump it from the machine onto either a floured or lightly oiled surface. 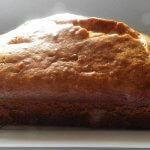 I prefer a floured surface but use only a minimal amount of flour. For this particular recipe, you can cut the large dough ball into 4 small dough balls and roll them out into a pizza shape or two larger dough balls for a thick crust pizza. 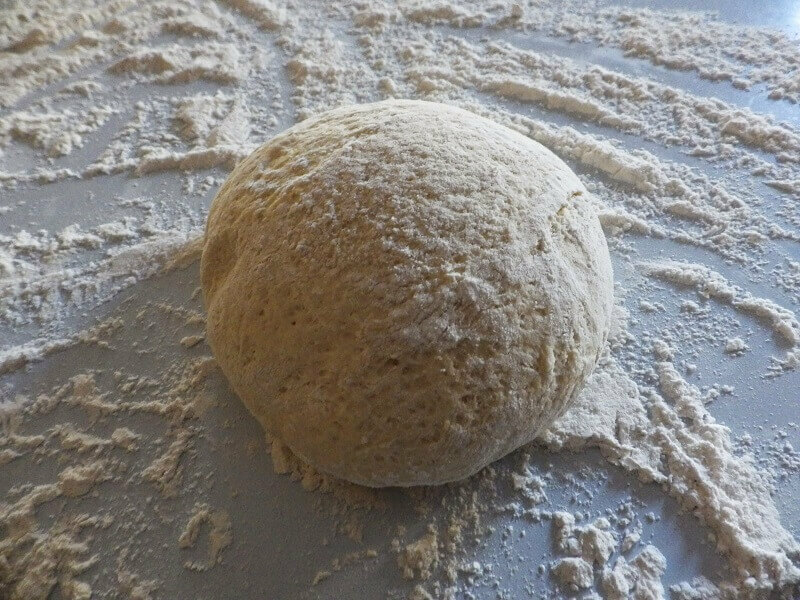 Let the dough ball rise on a floured surface for about 20 minutes at room temperature. Take the dough ball and roll it out on your floured surface. You can also stretch the dough a bit with your hands. 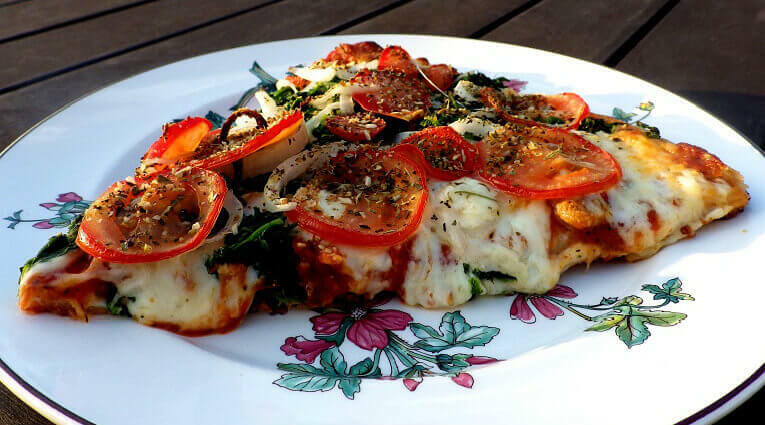 Don’t worry if you get an irregular shape instead of the perfect pizza round. 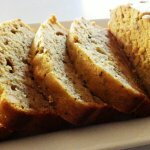 Everything homemade is a little uneven and rough around the edges. You can pinch the sides up on the edges if you like, but I just leave them flat. After you’ve rolled out your dough, place the rolled dough onto either a lightly oiled cookie sheet, or you can dust a cookie sheet or pizza paddle with coarse corn meal. This will help prevent the dough from sticking to the pan or the pizza paddle. Don’t put oil on a pizza stone. 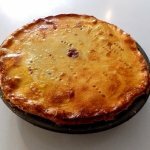 Corn meal is usually the only thing you want to dust a pizza stone with when you’re baking. Because the pizza stone is usually placed in the oven while the oven is preheating you’ll want to use the pizza paddle to carefully slide the pizza onto the stone. If you’re using a baking sheet you can top the dough with toppings while the pizza dough is on the baking sheet. Once your pizza dough is in place on the sheet or the paddle you’re ready to top. Put all ingredients in a food processor or blender and process until tomatoes are pulverized into a sauce. 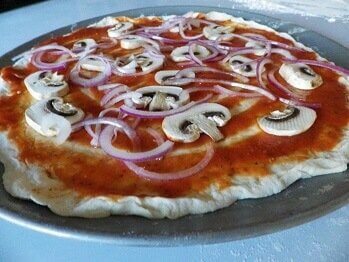 Rub the olive oil on the crust that's stretched across your pizza sheet. Spoon the tomato sauce in a widening circle. Don't use too much. 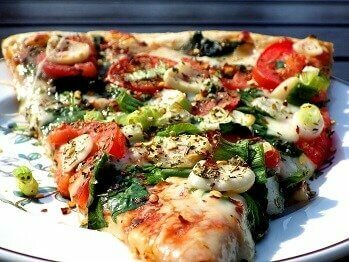 Dot the pizza with the spinach. Sprinkle the onion slivers over the top. 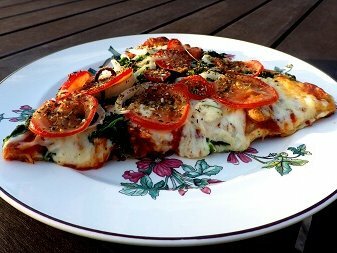 Evenly distribute the tomato slices on top. Sprinkle the garlic slivers over the top and finish with a sprinkle of the Italian seasoning. 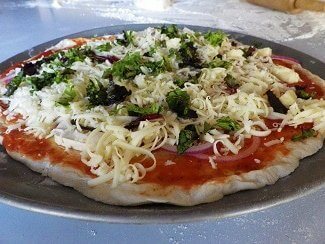 Sprinkle the cheese over the top at the end or the beginning of the process following the sauce. That’s up to you. Bake 15 to 20 minutes on the middle rack, but check after 10 minutes. 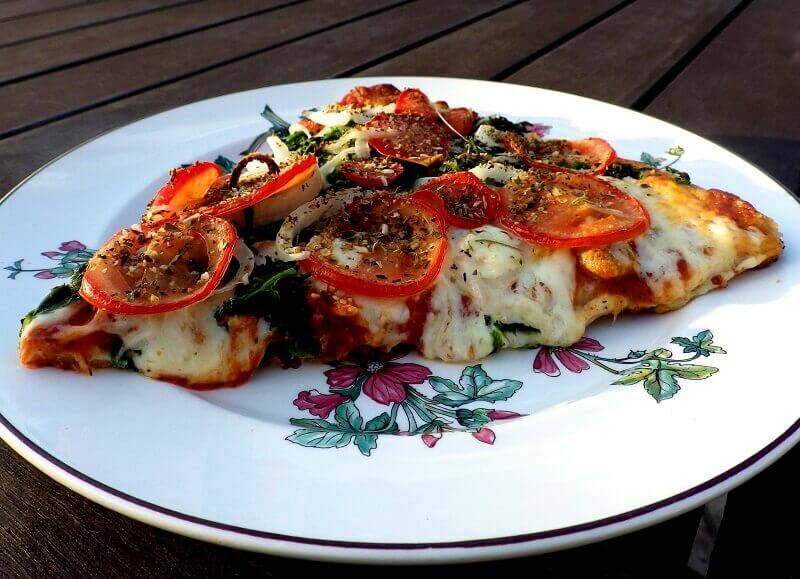 You want to lift the crust and make sure its crisp and that the mozzarella has started to barely brown. It could happen faster or slower in your oven.